This Bonneville cutthroat represents the first native fish in 50 years to be able to access spawning habitat in the headwaters of Strawberry Creek, a tributary to the Weber River in Northern Utah. Paul Burnett photo. 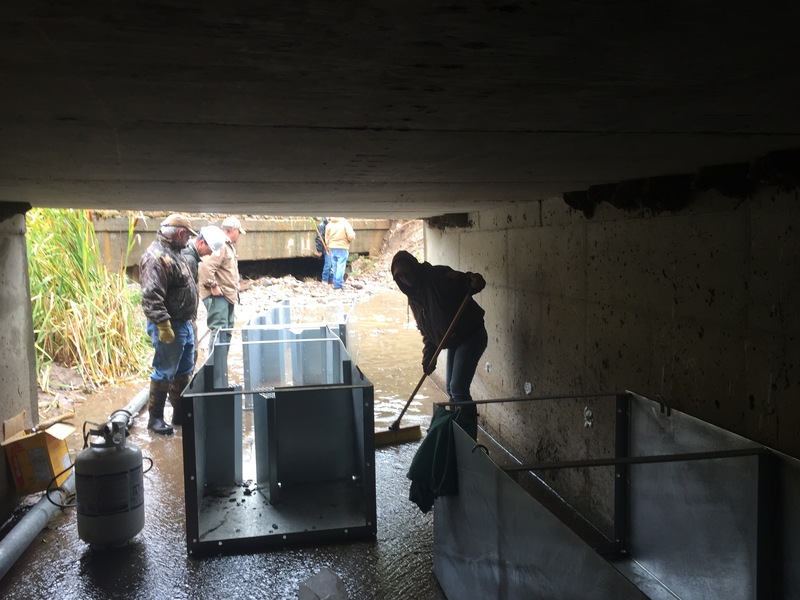 For the first time in 50 years, Bonneville cutthroat trout in Utah’s Weber River were able to ascend Strawberry Creek, an important spawning tributary, thanks to a major conservation effort in Northern Utah. Since 2012, Trout Unlimited has worked closely with many partners in the Weber River Basin to reduce habitat fragmentation and allow native fish to use migration corridors they had used for thousands of years. State wildlife officials and Trout Unlimited staff were able to confirm the presence of cutthroat trout in Strawberry Creek this week as the fish headed to spawning grounds they have not been able to use for five decades. This short video explains the issue on Strawberry Creek and how great partners and engineering helped overcome the barrier. When Interstate 84, and other highways like it, were constructed in the 1960s many culverts at stream crossings blocked historical movements of the native cutthroat trout, either because these culverts created a plunge pool with a vertical drop too high for the fish to jump, or because they were too steep and swift for fish to swim up. This was the case with the Strawberry Creek culvert near Ogden. This easily-missed and often-ignored tributary to the Weber River crosses I-84 about 400 feet upstream of its confluence with the Weber River. The culvert constructed was a box style, fairly large (10 feet wide) and very long. At 385 feet this culvert extends the length of a football field. It slopes at a 5.2 percent grade as well, which doesn’t seem like much, but when added up over the length of the culvert equals an 18-foot drop. The final pieces of the Strawberry Creek culvert fish ladder about to be placed in the fall of 2016. Brett Prettyman photo. Water blasts down the culvert at velocities fast enough to sweep the legs out from under an adult, making it impossible for fluvial (migratory) cutthroat trout in the Weber River to reach the 2 miles of spawning habitat above the culvert. We call this a complete fish migration barrier. At the time the culvert was constructed little was known about the fisheries in Northern Utah and no thought was given to ensure that these highway-stream crossings stayed passable for fish. Water conveyance was the primary interest. Recent research has shown these culverts have had a profound impact on the habitat for native fish by chopping the rivers and streams into smaller pieces. The cutthroat trout are cut off from important spawning habitat in tributaries. Natural recruitment of native fish was reduced, making it easier for nonnative species to take a firm hold on the fishery. Fragmentation may not seem like a huge issue when you look at a couple of streams here and there, and in some cases it has actually benefited species management, but when fragmentation reaches the scale of blocking all tributaries from a mainstem river, that leads to dramatic shifts in fish populations and their resiliency. This affects fishing. The Strawberry Creek culvert represented a really unique challenge in fish passage design. The length and slope represented almost insurmountable obstacles – not only for the fish, but for those of us who wanted to see the fish make it to spawning grounds. 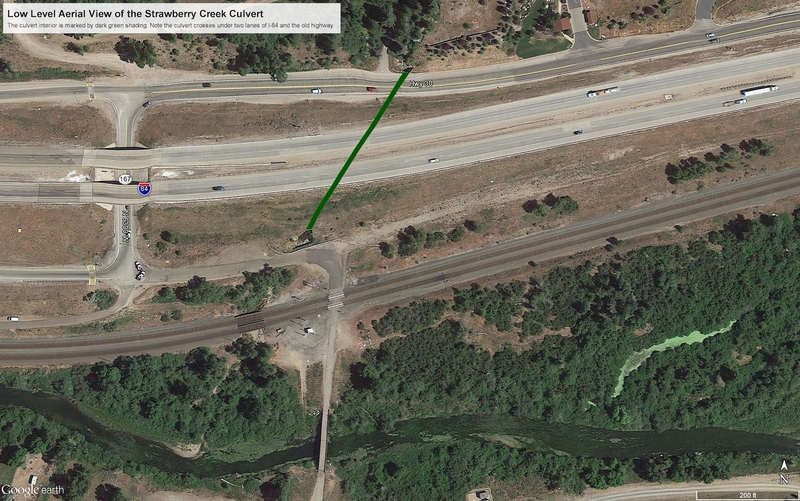 The green line represents where the culvert runs under Interstate 84. Google earth photo. Our members had noticed this culvert blocking fish passage as well. Kelly Marquart, the Weber Basin Anglers Chapter President at the time, called me, almost in tears from watching the cutthroat trout repeatedly attempting and failing to migrate up the culvert. She wanted to know what could be done. As a partnership, we were able to develop an Embrace-a-Stream grant to work on design. At the same time TU staff began working with commercial and agency partners to develop a funding structure to allow for us to design and pay for a fishway. We contracted with One Fish Engineering to design the fishway. Over several iterations of design, we decided to move forward with a fabricated metal, vertical slot fish ladder that we could ‘slip’ into the culvert in pieces. Vertical slot fish ladders work over a wide range of flows, which maximizes passage and reduces maintenance. We worked with MetaDesigns to fabricate the fish ladder in 44 9-foot long pieces. Each 9-foot piece of the fish ladder had to be connected to the other 43 pieces. Brett Prettyman photo. The ladder was installed in two days last fall with the help of chapter members, TU staff, Utah Division of Wildlife Resources staff and U.S. Fish and Wildlife staff. We placed it in pieces starting at the top and bolted it together. During the project several local residents stopped us to see what we were doing. One person mentioned remembering when she was a kid and watching the big cutthroat trout in Strawberry Creek and wondering what had happened. This project has come full circle. This native Bonneville cutthroat successfully navigated the 385-foot fish ladder reconnecting the headwaters of Strawberry Creek with the Weber River. Fish have not been able to spawn in Strawberry Creek for more than 50 years. Utah Division of Wildlife Resources photo. We are excited as well. This is a big day for our fisheries in the Weber River. These migratory fish are ecologically important; they represent a population of fish that have been in this river for thousands of years. They have survived decades of habitat fragmentation, river channelization and water extraction, but have found a way to linger and provide an opportunity for people catch and enjoy. We are thrilled to see these real successes on the ground, and look forward to continued improvement in the fisheries of the Weber River.